So, um, since the initial triad, the number of itty bitty books around here has just exploded. 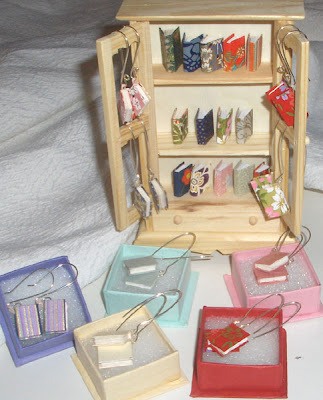 I am preparing for a spring sale locally, at the end of April, so now I have a cute little display of teeny weeny books and a bunch of book-earrings all set to go. When I made the books for the earrings, I reinforced the spine on the inside of the cover, and punched a little hole to feed through a loop that could be attached to the ear wires. I got these great handmade sterling silver ear wires on Etsy (of course) from CanadianRockies. Your little books are beautiful but I especially fancy the earrings. I have a pair made in NZ that cause much comment when I wear them but they are marbled and yours are so different and very pretty. The big silver loops are stunning. Good luck with yor April sale, they should go like hot cakes. Rhonda Gorgeous little book earrings!! You did a superb job! I agree that they will sell like hotcakes!! Everyone loves cute little things! I really need to try out those little books- they are sooo cute! Earrings are a brilliant idea- and great advertising! What do you make the covers out of? thanks Carol, Pegg, and Kiley! Kiley, most of them have Japanese washi for the covers - which is folded and pasted to itself and becomes quite sturdy, but there is no board in there. For the earrings, though, I added some card to the spine to make it stronger. A convert to the world of small books. When you find yourself intentionally creating leftover scraps from your big books, so you can make more small books, you know you're hooked. And at the rate you're going, you will be able to do your entire Christmas tree in book ornaments this year. They are fantastic, what a wonderful original idea. The cabinet shows them off very well. And great idea for the tree, eb! They certainly are fun to make, although I've also discovered that they require a completely different set of arm and shoulder muscles! I'll have to give that a try for the cover- I only have a million scraps of paper. At least they aren't all over the place anymore they are neatly placed in a box, in a tote. So picking a nice washi scrap should be no problem. awwww cute! i have a bunch of scraps that i've wanted to turn into little books, they're just so adorable!